Oddly enough, it didn’t take long for militia folks to start fighting over POCOs in low-sec once Crucible was released. I was somewhat surprised as I don’t really know of many people in faction war that even does PI. Okay, so why are faction war peeps fighting over planet structure thingies? It makes sense. We don’t really have anything else to fight over except plexes, and those don’t make that satisfying explosion at the end when you kill it. (Also, it just respawns somewhere and you have to do it all over again.) Did I mention they don’t explode? Also, we live in low-sec and the whole POCO thing is happening in low-sec so it makes sense that it would affect us. Did I mention that POCOs blow up? Talk about an obvious way to ‘fix’ faction war. Ironic, that faction war instantly gravitated toward fighting over these. 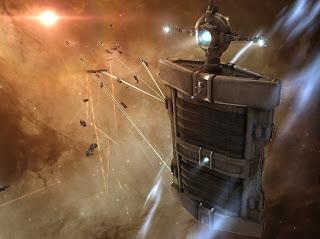 Like we’ve been starved to death for something to fight over that isn’t a button that counts down and will just despawn somewhere else once it’s ‘taken.’ Like we haven’t been starved to death for something we can kill that the enemy actually had to invest time and ISK into putting up—not just another NPC red X. Like we haven’t been starved for fighting over something that makes that satisfactory boom when we’re victorious. Kind of ironic that people could think of all these elaborate ways to ‘fix’ faction war, and all CCP does is introduce a new structure and they are flocking in with their dreads and battleships to make it go kaboom. Nothing fancy. Just a structure that explodes when it’s dedded. Hopefully someone in CCP is paying attention. - something that can be destroyed and thus requires defense. The complexes fail because defending them and the systems the represent do not have real consequences for being lost. I agree, hopefully CCP is paying attention. New POCOs are great for finding fights lately. I just hope novelty doesn't wear off too soon. You know, I wonder how many people actually really care about taxes and just use POCOs as an excuse to get a fight without bothering with annoyances of insane HP and defenses of towers... We need a poll on EVE-O forums or something.